Enhance your display's audio with the Definitive Technology W Studio 320W Soundbar System. It includes a soundbar with six 3" mid-woofers and three 1" tweeters, plus an 8" wireless subwoofer for low bass impact. Its ability to decode Dolby Digital and DTS signals is designed to create a broader soundstage and improve the quality of your sound compared to your display's speakers. The W Studio has built-in Wi-Fi with Play-Fi compatibility for wireless streaming of your favorite audio content. 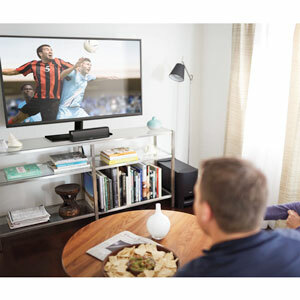 Its wired connections include three HDMI, one optical, and one 1/8" audio input with an HDMI output to your display. It includes wall mount brackets for the soundbar and an IR remote control. The W Studio soundbar is built with three aluminum dome tweeters and six full-range mid-woofers. The included wireless subwoofer adds enhanced bass. The W Studio lets you stream your favorite music from your smartphone, tablet, or computer from nearly anywhere in your home. Mix and match speakers with the open Play-Fi Technology standard and the free Definitive Technology app. The Definitive Technology Utility app offers extended functionality, including product firmware updates and source selection, if applicable. 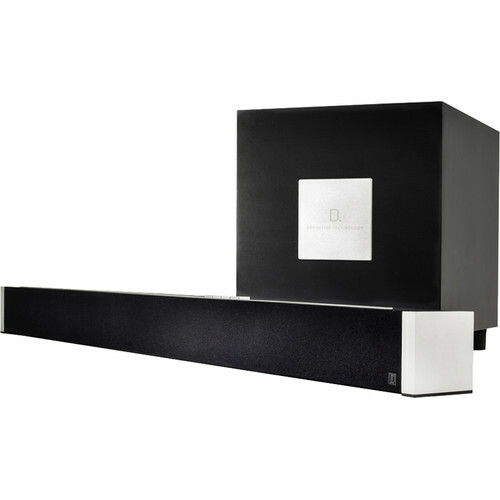 Box Dimensions (LxWxH) 48.0 x 23.0 x 16.5"
W Studio 320W Soundbar System is rated 5.0 out of 5 by 1. Rated 5 out of 5 by Anonymous from Great Sound Tested and looked at many of the high end sound bars but this one wins! Smaller in size and with the added sub makes a big difference. Being able to add additional speakers is nice.